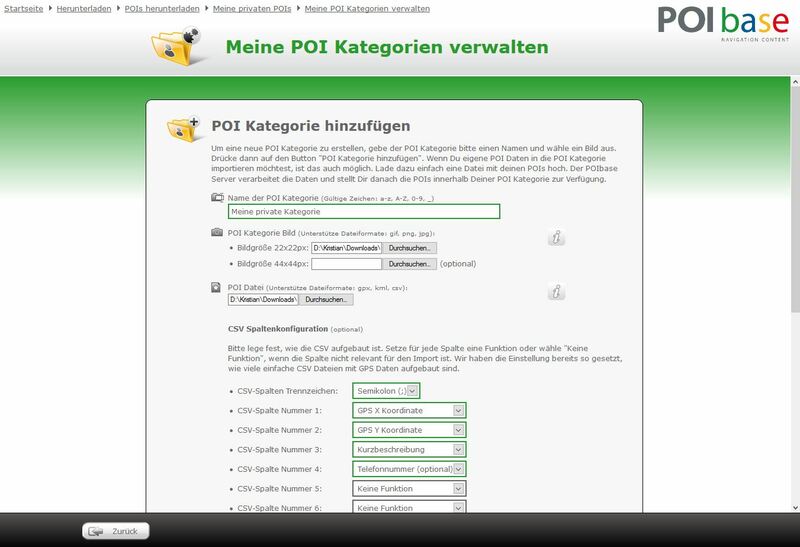 The POIbase PC application has become more flexible and developed a better method to import your own POI collections, which are available in CSV format. A new feature makes it possible to add extended CSV files, including phone numbers, customer numbers etc. to POIbase with little effort. In the past, differently formatted CSV files made it difficult to import own custom POIs to POIbase. Especially files with many additional lines or incorrectly formatted values had to be edited first. Such files are no longer a problem to the new extended POIbase CSV import. The new CSV import has a column configurator, which can be used to determine the value of the respective column. Using various separators is also possible. Furthermore, each new POI category can be provided with its own name as well as an image with which the entries of the CSV file are displayed later in the POI category overview as well as on the map. All imported values such as addresses, email addresses, and phone numbers will be displayed later in the details of each POI and are therefore also available on the navigation device or via the POIbase app. In the case of in-dash navigation devices, such as Audi, the stored telephone numbers for a POI can also be called. The new CSV import function is now available and can be accessed via the following menu item in POIbase: Download POIs > My private POIs > Manage my POI categories. Our POIbase support also answers further questions on this feature. Of course, we are always happy to receive your suggestions.